Poll (v1) What's your A64 o/ced speed?? View Poll Results: Vote the overclocked speed of your A64! 3003 MHz --> 3 - 3.1GHz! San Diego 3700+ OK it is an old fashion CPU LOL I know it! Last edited by MrSeanKon; 17th November, 2006 at 02:14 PM. Thread's title is not for all AMD users that's why this option is not included. You may create a similar in general AMD category for voting. 3ghz for an Opty 148 under a TDX block. 1.8GhZ Venice 3000 overclocks safely to 2.5Ghz on air. Currently clocked at stock due to new Windows install. Am going to look on Bios and give it a tweak. 3700 San Diego (285 X 10) under Si-120 @ 26C case ambient; 1.44v monitored in CPUz and Speedfan. I don't use this as a daily setting, it's just where I arrived at (while tweaking some memory, and running SuperPi and Everest to validate changes to memory-cpu results). If any CPU could run higher (and stable) without bumping Vcore why not more MHz? Guys you forgot the best chip of all - the Sempron. 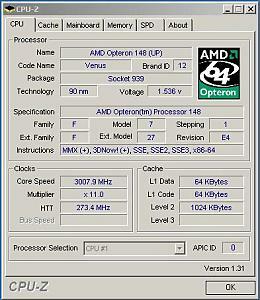 Some Semprons are high overclockable like Intel Celerons. San Diego 3700 2.2@2.6 on air. You may increase Vcore for more MHz..
Last edited by MrSeanKon; 27th November, 2006 at 08:25 AM. A64 3200 at 2.5Ghz on air. Can't seem to get much higher. Then again, the temp is only at 35C (Speedfan) while only running WMP and MSIE. RAM will go up to something like 310 (DDR620) without problems (i sent that other 512mb back). Perhaps lowering my HTT to 2x would help OC the CPU (ATM, it's set at auto). If i can get 2.8 then that's the best i could hope for (That's the original speed i've been trying to get to). So if i got for 295/9.5, that'll get me 2802.5 and DDR590. Perhaps lowering my HTT to 2x would help OC the CPU (ATM, it's set at auto). No option for changing Hyper Transport ratio in BIOS? Like my previous Albatron 754 socket? Sorry what do you want exactly? On the other hand I read your sign; you don't have an AMD. Correct if I am wrong..
Last edited by MrSeanKon; 28th November, 2006 at 12:45 PM.